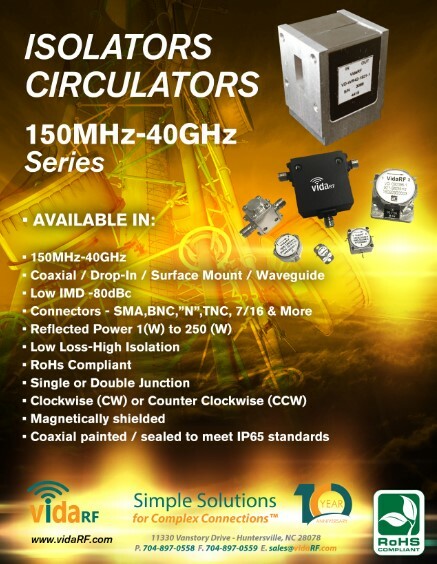 Huntersville, North Carolina - February 2, 2018 - VidaRF offers a line of isolators and circulator covering frequencies from 150 MHz to40 GHz, with reflected power levels up to 250 W. Coaxial (SMA, BNC, N, TNC, etc. ), drop-in, surface mount, and waveguide configurations are available. Low intermodulation products (-80 dBc), low insertion loss, and high isolation are standard. Panted and sealed to IP65 standards.